I wanted to circle back to last week’s story in the L.A. Times about the release of the draft environmental impact statement/report for the Westside Subway Extension. 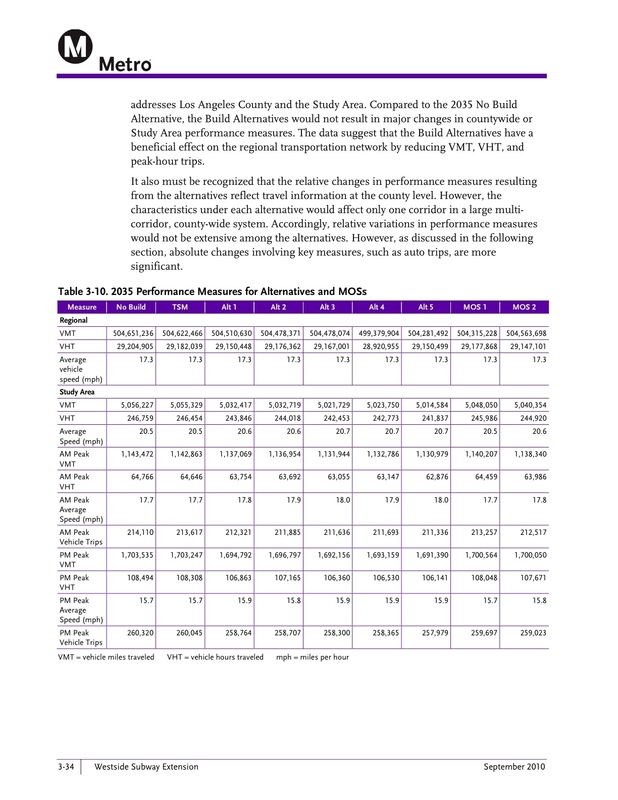 In short, the story reported — correctly — that according to the study, the subway would barely reduce traffic in Los Angeles County or on the Westside. Thus the reason for the above poll. My two cents: I thought the story was fair. When four billion dollars are about to head out government’s door for a big transit project, the local media is going to kick the proverbial steel wheels hard. That said, I also thought the story was completely obvious. As numerous comments left on the Times’ website and Metro’s Facebook pages pointed out, other cities with big transit systems still have big-time traffic. I suspect most people know this. Problem is, officials sometimes slip into sound-bite mode and suggest traffic can be fixed. In doing so, they give the media a reason to pounce. •Transit can be a great alternative to sitting in traffic. How bad is Westside traffic? See this post on Supervisor Zev Yaroslavsky’s website that explains the Westside is the most congested part of the region. •Trains and buses can save commuters time and money. •Trains and buses usually are less polluting than private vehicles because of the number of people they can carry. •A good transit system can keep traffic from getting worse and possibly take the edge off existing traffic. •Transit is good for creating more walkable, livable neighborhoods — unless you’re idea of a great neighborhood is one filled with parking lots and garages. As for the Times’ story, the information largely came from the three charts on this page. The first two charts are from the first part of chapter three of the draft study — click here to download. (After the jump you’ll find the two pages with the chart and the accompanying text.) The third chart is from the first part of chapter four — click here to download. It is important to note that alternatives one and two are the two subway routes that have a funding commitment; alternative one is the route largely down Wilshire Boulevard to Westwood/UCLA. Alternative two extends that route to the VA Hospital, just west of the 405 freeway. 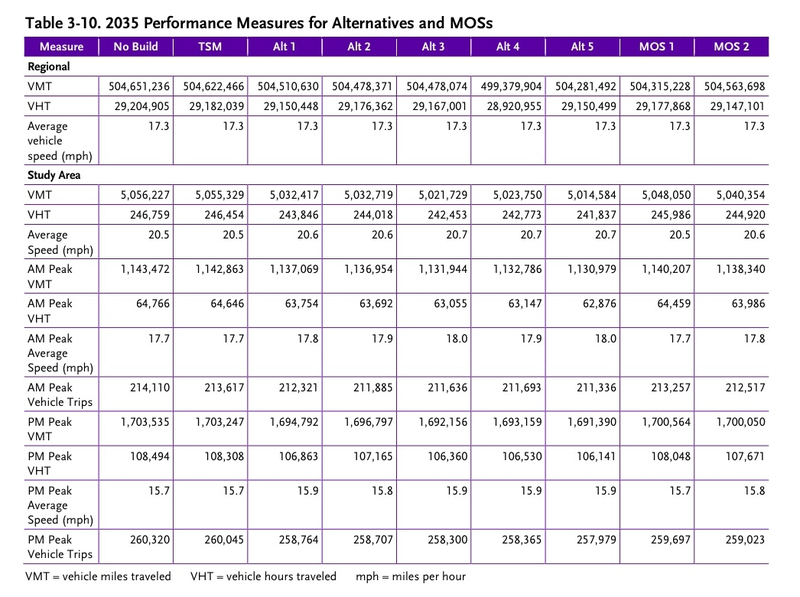 The first chart projects traffic speeds and vehicle miles driven in 2035 both by the enormous six-county region and the much smaller 38-square-mile study area on the Westside. In the region, the impact of the subway on traffic is very small — it’s a huge region. There is more of an impact, as expected, in the Westside study area where the project will be built. 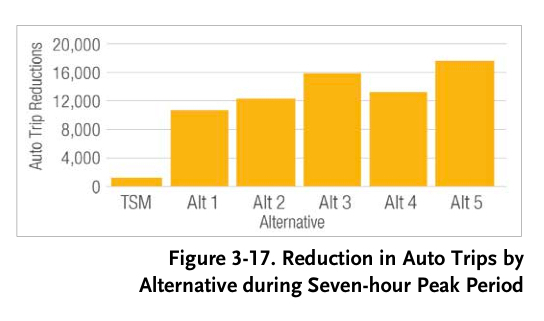 The second chart projects that the subway’s alternate routes have the potential to pull at least some vehicles off county roads during peak rush hours. It’s not a huge number when considering how many vehicles are on the road across the county. But it’s something. 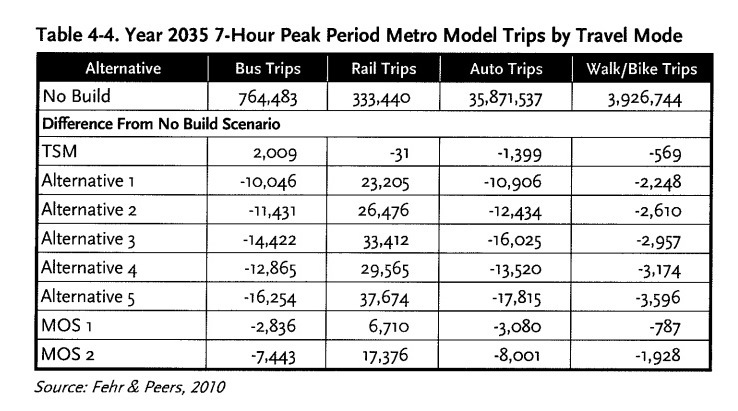 The third chart projects how commuter trips will be taken in 2035. The conclusion is that the subway will mostly pick up its riders from those who were previously taking the bus or driving. Another point I would like you to consider. The existing subway in Los Angeles has more than 150,000 boardings on an average weekday. If the subway didn’t exist, those boardings would be on other modes of transit. Maybe buses, maybe private cars. During rush hour, do you really want any more cars or buses on the roads between downtown L.A., Koreatown, Hollywood and North Hollywood? The actual number of motorists who shift to transit may be relatively small, but is enough to reduce delays. Congestion does not disappear, but it never gets as bad as would occur if grade-separated transit service did not exist. How can one small subway line (the westside extension) be expected ON ITS OWN to cure traffic on the westside or anywhere else for that matter. One thing is for sure, every rider who takes this line is NOT IN A VEHICLE. So lets look at what the traffic would be if we did NOTHING. The westside line ( a crucial first line for the westside) is hopefully only the first in a series of future ones for the westside. Until Los Angeles has a system similar to Boston or Washington or even approaching NY, mobility will be limited because the existing lines are limited! In addition, the city needs to get its act together and implement ONE WAY STREETS in the busiest sections of the city. Until the city can handle the amount of cars efficiently, there will be no relief of traffic. Regardless of what merchants might say about one way streets (they are seeing declining revenue anyway because people can’t get around the city as it is), One way streets are a logical alternative and far cheaper than 4 billion to implement. This should be done in conjunction with the westside subway line. New York would be a nightmare if it were not for one way streets. Its bad enough with one way streets. The truth is we need to do everything not just one thing. 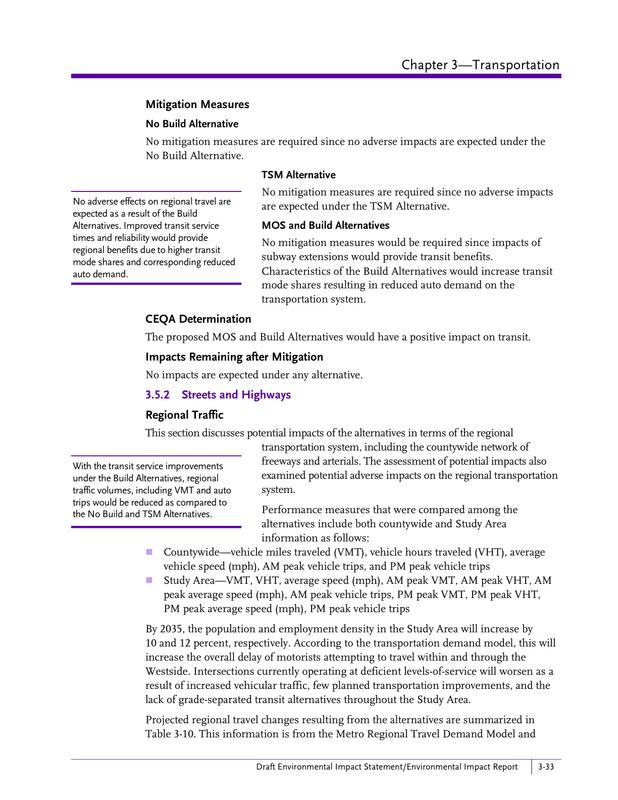 A 20 year plan shoud be in place to get more subways going where people want to go not just downtown, more efficient express buses utlizing the existing routes we already have, a plan to transfer to one way streets and figure out a plan to limit vehicles during peak rush hours. Without the options of subway and possibly express buses, there IS no choice but to drive in a city as large as LA. The study is misleading because it does not take into account those people who choose not to go somewhere because they don’t want to deal with traffic. The trains give people another choice who otherwise might stay home. For example, there are many times I consider going to 3rd Street in Santa Monica on a Saturday. But I decide not to because I don’t want to deal with traffic. With a train to SM I would go. These traffic studies don’t take into consideration these types of people. The problem with the LA Times story of course is not that it reported the content of the DEIR incorrectly… the problem is that LA Times choose to focus on one tiny detail and use it to frame the entire story in its headline. An impartial news report probably would have lead with something like “Subway will improve transit time and draw more riders but not solve gridlock in Westside”. I wish that Los Angeles would realize the consequences when the GM (and special interest groups) destroyed transit in early 20th century. If corporate greed and wrong politics wouldn’t have their way, Los Angeles could have been a Mass Transit leader, as it was a long time ago. Unfortunately now we have to reinvent the wheel, and re-build what GM has destroyed. Hey — thanks for the kind words and taking the time to read it. I wanted to throw my two cents in about the demise of the streetcar system. I’m of the view — and I know some disagree — that there were many, many reasons the streetcar system was allowed to fall into disrepair and eventually shuttered. Yes, there may have been some special interest involvement, but there was also the fact that people and public officials in Southern California fell in love with the automobile. While the streetcars have been much romanticized, often for good reason, it’s often overlooked that they were often slow, couldn’t keep pace with the region’s un-ending appetite for suburban homes and got into accidents with private vehicles and pedestrians. And, in the end, there just wasn’t enough of their constituency left to save them. Thanks for the informative series of articles. The hyperbolic criticism in the Weekly and elsewhere only highlights the anxiety about there about change. But change we must. But infrastructure is only one part of it. It’s change of behavior. Programs that encourage cycling or use of mass transit can change mode choice, and I believe once that choice is made, folks won’t go back. The least productive activity I undertake is moving my car through LA Traffic. On my bike I see and smell the city and get a workout too. It’s crucial that this massive investment be coupled with program innovations, too, that redirect the subsidies long provided to motorists toward more environmentally-friendly forms of transportation. I’d rather put half the cost of the ride price into the pocket of the home-to-work transit user than indirectly funnel it to car manufacturers, insurers, fuel companies and the rest. It’s time we put public money where it will have a behavioral impact, as well as into infrastructure, whether it’s subsidized monthly passes, folding bikes or whatever.